← Chief of Department Peter Ganci Jr.
Deputy Commissioner William Feehan, 71, was rumored to know the location of every single fire hydrant in New York City. When named Chief of Department in 1992, he was the first to have held every possible rank within the department. He was the oldest and highest ranking firefighter ever to die in the line of duty, with 42 years on the job. A firefighter tells the story “about a synagogue fire in midtown a couple of years ago. There was a collapse inside the synagogue and a huge plume of smoke came up, and there was a thunderous roar, and everyone was getting out of the way, and here was Bill, running into the smoke and fire — and he was 70 years old! A military history buff who had served in the army in Korea, Feehan would walk civil war battlefields on vacation. A widower, Feehan had four grown kids and six grandchildren. One of his sons followed him into the FDNY. This entry was posted in Better Angels Stories and tagged 343, 9/11, better angels, Dawn Siebel, FDNY, firefighter, firefighters, firefighters of 9/11, LODD, Manhattan, memorial, NFFF, paintings, portraits, William Feehan, World Trade Center, WTC. Bookmark the permalink. Commisioner Feehan was a mentor to all the young men in our community. He gave us guidance and inspiration to join the FDNY. He is greatly missed! I agree with Mark Barrett when he wrote, “Commissioner Feehan was a mentor to all the young men in our community. He gave us guidance and inspiration to join the FDNY. He is greatly missed!” I began my fire service career as a volunteer in North Carolina in 1992, when Feehan was the Chief. I looked up to him even before I ever met him. It was great people like Feehan who inspired me to join the FDNY. Each time I met him he was always warm, compassionate, friendly and caring. I still have deep admiration for him today. He never let his position go to his head, and he always took time to talk with, listen to, or teach even the youngest and lowest members of the department, like the Probies. He even took time out to teach me a little when I was a new guy in the EMS academy. He only spoke words of wisdom and encouragement. His presence always radiated greatness, and people seemed to pause in awe whenever he walked into the room; yet he still carried the kindness and caring of a grandfather figure. 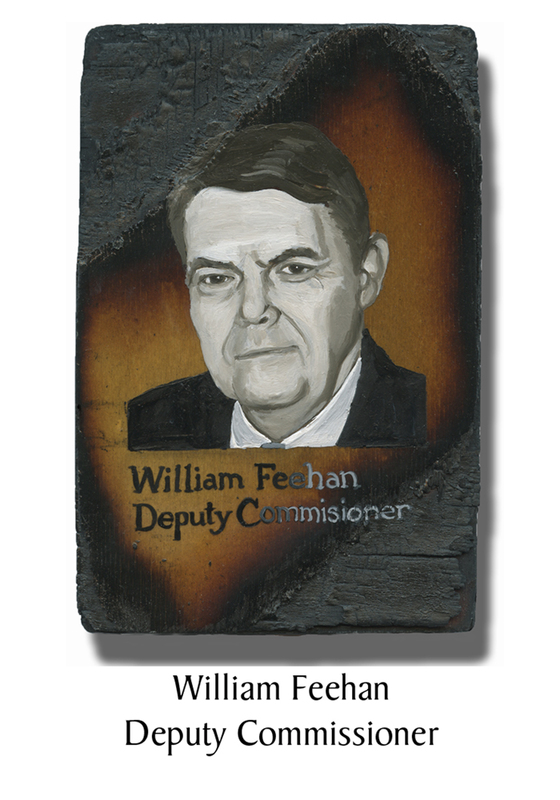 When I saw him with Chief Ganci on West Street, he smiled at me and John Ceriello, and I had a sudden sense that, despite the horrors around us, everything was going to be OK because he, William Feehan (the real deal), was watching over us. There will never be another one like him. He will be greatly missed forever.